Have you ever placed someone in the friend zone and they just REFUSE to play nice and stay there, instead they want to buck the system and become a "Breakout King" and become your new boo thang? Or have you ever just blatantly told someone "look mofo, this ain't gonna work, we aren't suited for each other and being distant 'friends' is bout all it's gonna be?" Oh so I'm the only one with this problem huh? mmmk.. I'm so glad you asked. And by the way, since I will be sick and shut in for the next few weeks, you just might get more blog posts in between my naps post-surgery.. but anyhoo back to the discussion at hand. 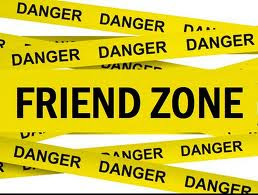 Let's say girl meets boy, girl realizes IMMEDIATELY she ain't interested, but thinks boy is cool and places him in the friend zone.. or as some of my blog counterparts call it "friend zone prison" with no chance of parole. Let's examine what the friend zone is shall we? I place men folks in the friend zone when I'm not interested in them romantically, physically, and hell sometimes mentally is even a stretch, but they are cool peeps and I don't want to cut off ALL communication but sometimes you have to throw some of em in the friend zone dungeon to never be heard from again..
Now most of us folks that have had the lucky opportunity to be friend zoned know that there's usually no way in hell you getting out of that zone, unless you get bumped up a level to "a friend with benefits"..-Meik Meik don't play that.. but some of you do, and hey..no judgements from over here.. just keep your eyeballs peeled for red flags when you busy hunching and humpin cuz you could end up with a crazy, deranged janky eyeballed mofo but hey.. don't mind me. I'm sleep. Then there are those that are determined to not take the friend zone as the final answer and they keep on and on and on til the break of dawn. 1. If I don't answer your calls.. EVER.. and you constantly get sent to voicemail..chances are... you just ain't what I'm looking for even in a friend at this point. 3. If I don't take you up on ANY opportunity to hang out... chances are .. welp I just don't dayum wanna be bothered. 4. I am not a mind reader, so say WTF you mean and all this guess what I'm feeling ish..I'm not here fuh it. We grown. There is NO CHANCE FOR ROMANCE BRUH. 5. Sending cryptic messages on social media sites will get you ignored even more. That's just a few of the things on my list for folks that won't stay *stomps and pushes HIM's head back down into friendship hell* where the f I want them to stay. So, my question to you dear fam, how do you handle someone that you have friend zoned that won't take that at face value and stop trying to break out of the friend zone, ESPECIALLY if you have told them you aren't interested in them that way? Do you cut off all communication? Block em on every social media site? Change your phone number? Meik..forever the friend zoned homegirl..never the girlfriend (that's another topic for another rainy blog day! Ya'll be good! I cut off all communication and, sadly, that's usually the way it works out. I have a friend who "friend zones" people ... but then she does stuff like call them pet names, lets em pay for stuff, fix stuff for her, etc. Then, she doesn't get why they want more than friendship. So, first of all - yes, ignoring texts, letting phone calls go to voice mail, etc is the way to be. Period. If that doesn't work and they don't get it? Honestly, I think they are somewhat crazy/stalkerish if they are still after you. Which leads to ... cut off communication - don't respond to texts or calls at all. Sad, pathetic dudes out there. Bless your heart, girl. Good luck. The friend zone is a place for friends. You can't keep Godzilla in the friend zone. You gotta run. I initially wanted to say there seemed to be a communication issue, but after reading the entire post, I realize the only issue here is your friend has completely disregarded the hints. Bless his heart. In that case, yeah, drastic times call for drastic measures. I'm seriously trying to figure out what makes a guy continuously call the woman who never answers his call and ignores his text? Number 5 is hella funny.